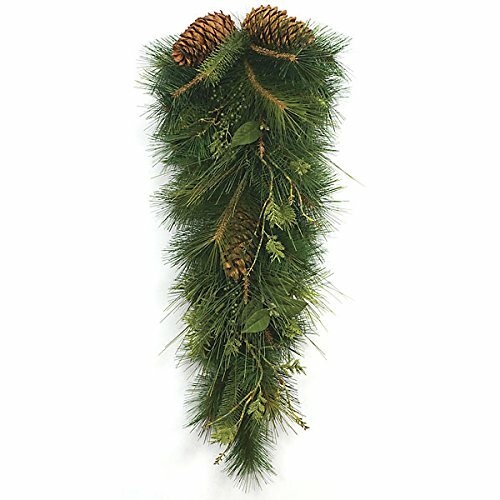 36'' Artificial Sugar Pine, Pinecone, Berry, Juniper & Laurel Teardrop Swag -Green (pack of 2) by SilksAreForever at Two Clock. MPN: C84040. Hurry! Limited time offer. Offer valid only while supplies last. Stunningly beautiful, this 36'' artificial sugar pine, pinecone, berry, juniper & laurel teardrop swag will never need a drop of water or pruning. Stunningly beautiful, this 36" artificial sugar pine, pinecone, berry, juniper & laurel teardrop swag will never need a drop of water or pruning. Deck your home with our gorgeous, handcrafted swag. Easy to store and reusable, as it never wilts, and is crafted to last for years! Place it proudly above your mantel, an exterior door, window or even on your kitchen wall to create a timeless holiday theme! And... You'll get to cherish it for a lifetime! This listing is for 1 pack. You will receive 2 items per pack, 1 item shown in picture, which may be a closup view. Actual size after shaping: Height - 36", Width - 14"
If you have any questions about this product by SilksAreForever, contact us by completing and submitting the form below. If you are looking for a specif part number, please include it with your message.